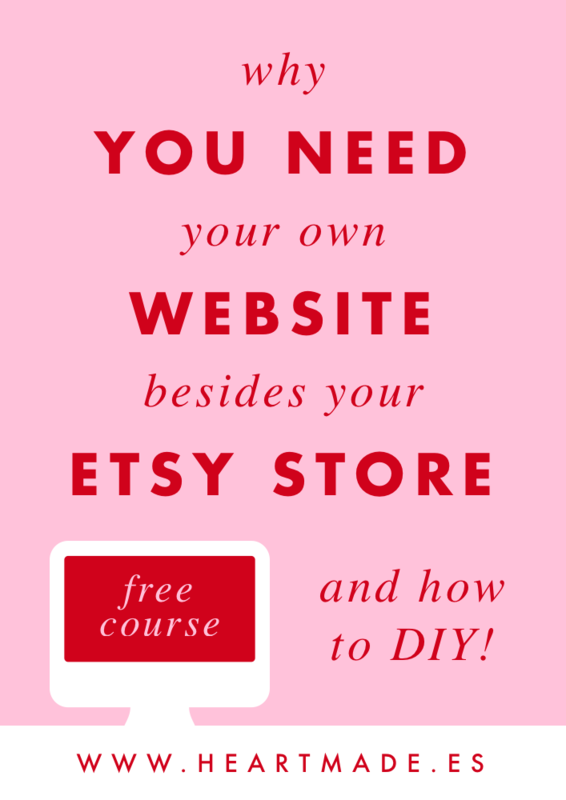 Chances are that if you are reading this post is because you are a maker and you are selling your creations in Etsy, but considering the possibility to also have your own website to boost your sales. Then, you are in the right place. 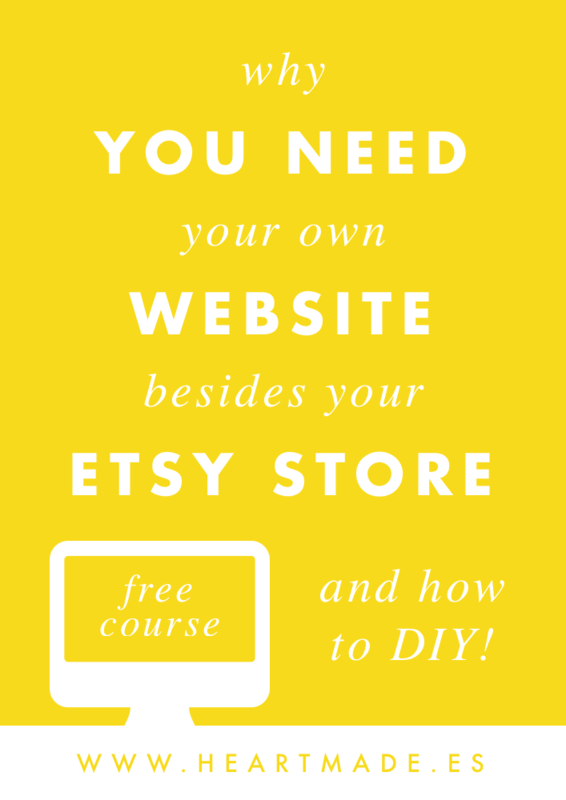 Because today I want to talk about why you need to have your own website besides your Etsy store. Plus, I’ll teach you how to do it yourself!! Although Etsy is constantly improving and adding more branding features, your options are still very limited and their own branding will always be over yours. I’ll talk more about this later, but considering creating your website with “Pattern by Etsy” is not the best choice. Although you can customize it with your branding, it is still limited in terms of analytics and SEO control, plus the monthly fee is higher than paying for your own hosting. I don’t know how many times I’ve said this, but SEO is key to online success. I’m sure you are thinking about SEO when writing your Etsy titles, descriptions & tags; but that’s not enough. I’m giving away for free the ultimate guide to create your own website, in which I include the best tips you can get when planning to open a new web for your business. Also, search engines like Google will be glad to show your website when someone searches for your brand online. Having your own domain is one of the most important SEO steps you should do for your brand. If you haven’t done it already, I invite you to read my last blog post about “the things I wish I knew before registering my website domain”. Etsy is a platform to sell, and although they want you to sell your products because like that they can win their commission, at the end they don’t really care that much about YOU. They just want to sell, no matter what… So when someone visits your Etsy store they will start seeing also other similar products from other Etsy shops (your competence). 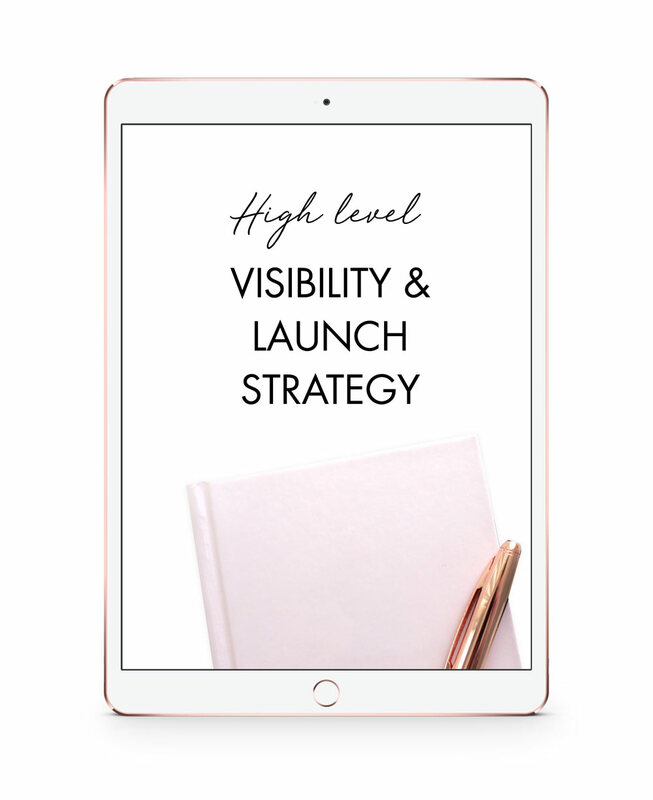 In your own website your potential clients will only see your products, and even if you feel like you don’t have the time and the energy to set up your own e-commerce, don’t worry! I’m not writing this post to convince you to have an e-shop, having just a corporate website and continuing processing the sales through Etsy can still give you tons of benefits. 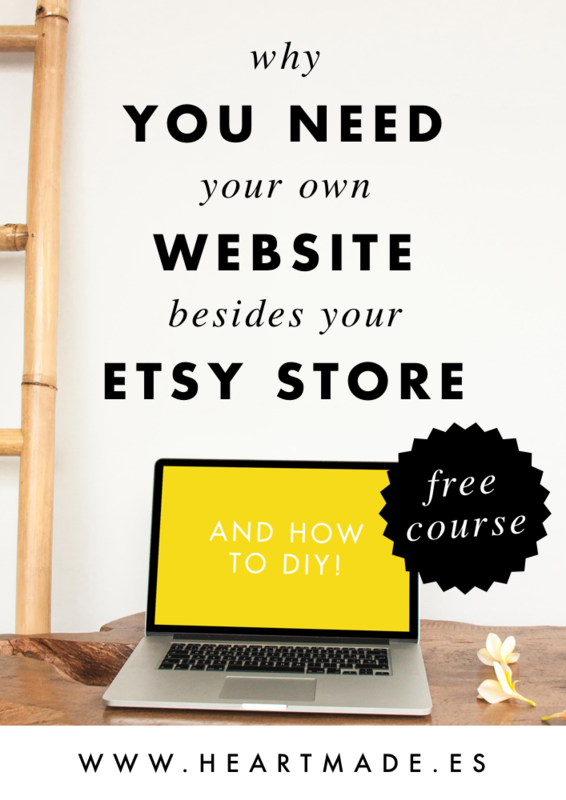 After following my ultimate guide to create your own website you will see how easy it is to connect your Etsy store inside your own website. That way you will not need to manage your stock and orders in two different platforms. But first, don’t skip my ultimate guide to create your own website, because whatever it is your final decision, in this guide you will find everything you need. When customers find you on Instagram or Pinterest, fall in love with your creations and decide to check for your prices they go to your profile looking for a shop link. If you are starting and don’t have many sales in Etsy, I strongly recommend you to take inspirational pictures of your products and display them in your own website. Like that, your customers will see how professional you are and will not even care if later you send them to finish the purchase in Etsy, they will be already convinced of how great you are! Also, if you are not starting and have many sales in Etsy, it’s time for you to give a better look to your brand. Of course all those good reviews and Etsy experience will help you a lot, so as I said before you can create your corporate website and continue selling through Etsy. 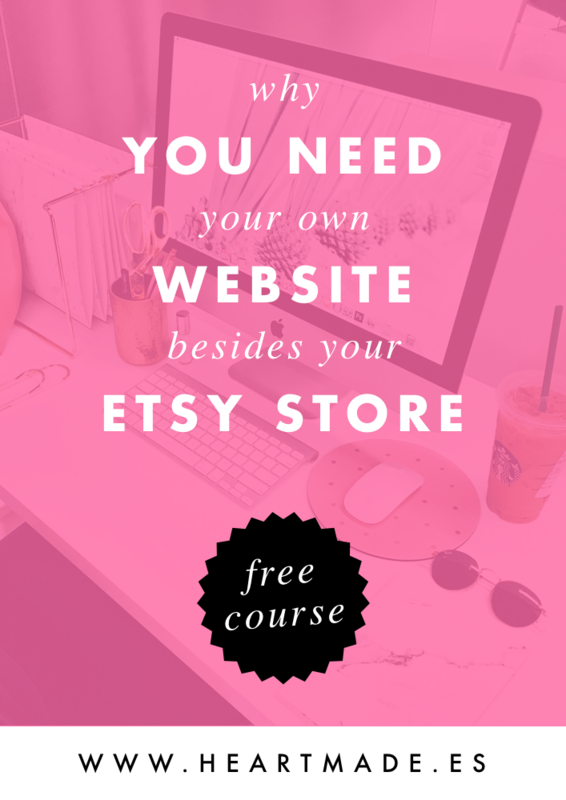 Now that you know all the reasons why you need to have your own website in addition to your Etsy store, let me invite you to my free course to create your own website. After so many years of experience designing and developing websites for people like you and me, I found that what everyone struggles the most is with their website content. So in this free course I’ll guide and give you the exact instructions you need to create the most important pages of your website. Then, when all your content is ready I’ll share with you my favorite ways to create your own website.